Friday January 29th was my travel day back home to Texas from California. My flight was scheduled to leave Ontario International Airport around 11:am, but instead of sleeping in I set my alarm for 5:00 am. 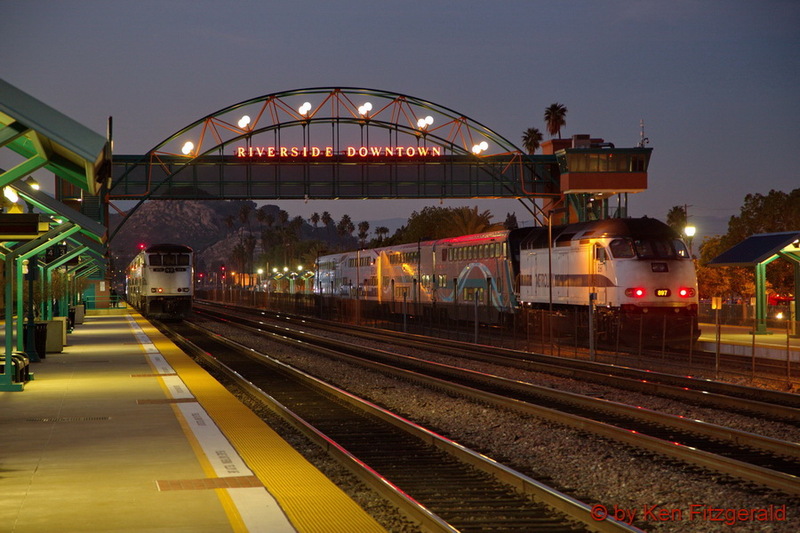 I checked out drove from San Bernardino a few miles west to Riverside, California. 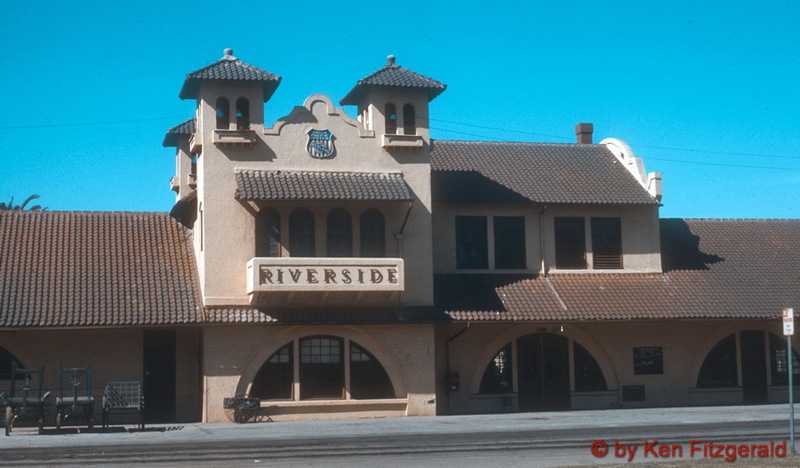 The last time I had visited Riverside was during a family vacation back in February 1971 at age 16 and I was curious to see what had changed over the intervening 45 years. 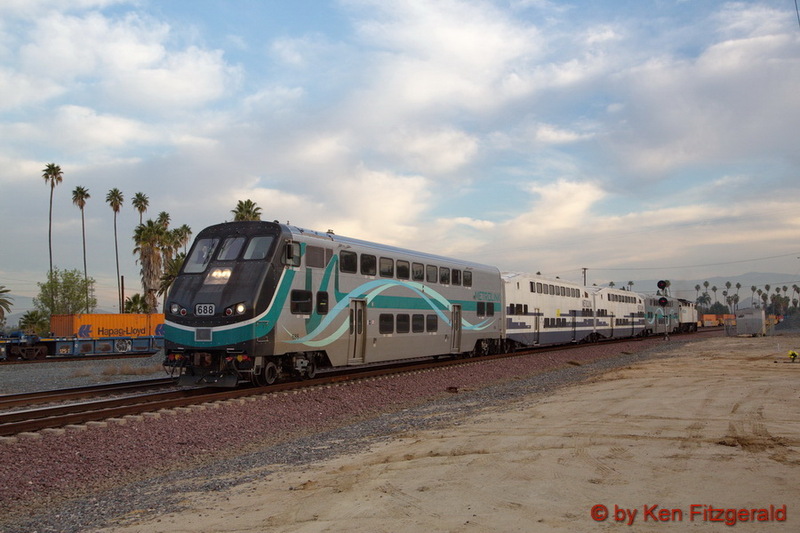 One big difference was the overwhelming presence of the Metrolink commuter rail. At 7:00 am with the moon still high in the sky and sunrise around 45 minutes away I took these two photos of a train laying over in their maintenance area. 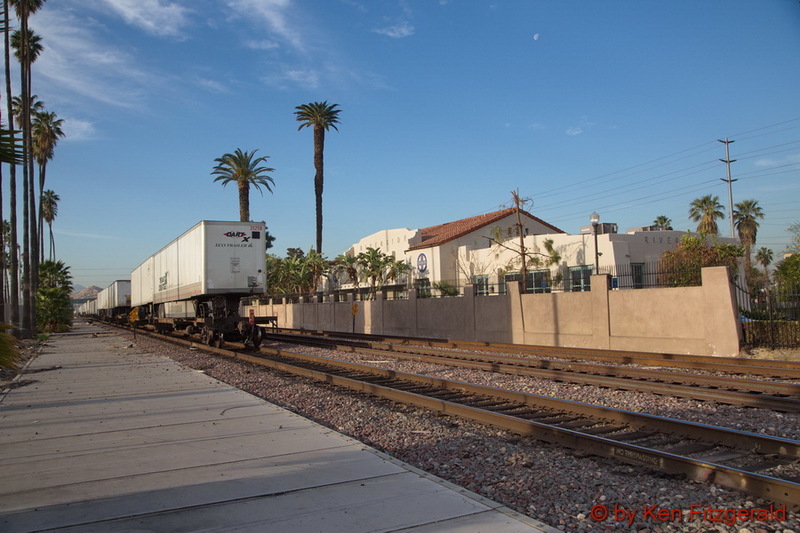 The old Santa Fe depot can be seen in the background on the right on the other side of the double track main line. 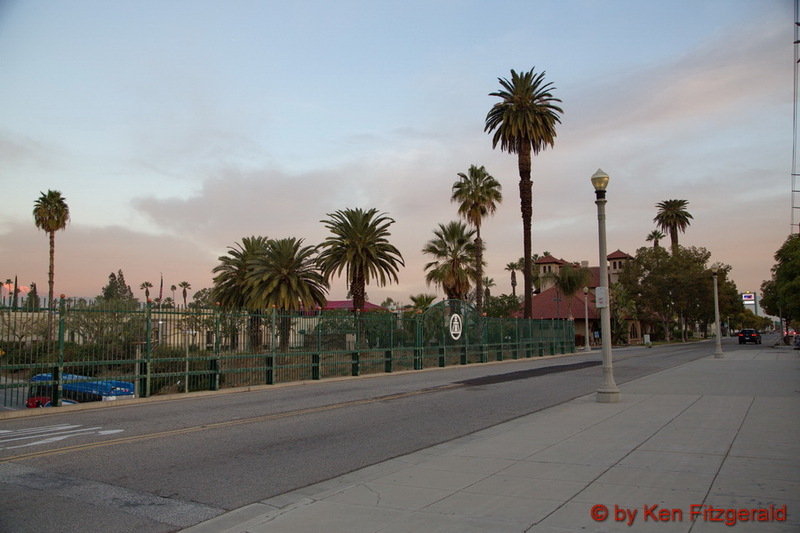 I walked down to the Metrolink station and took this photo as the light improved. 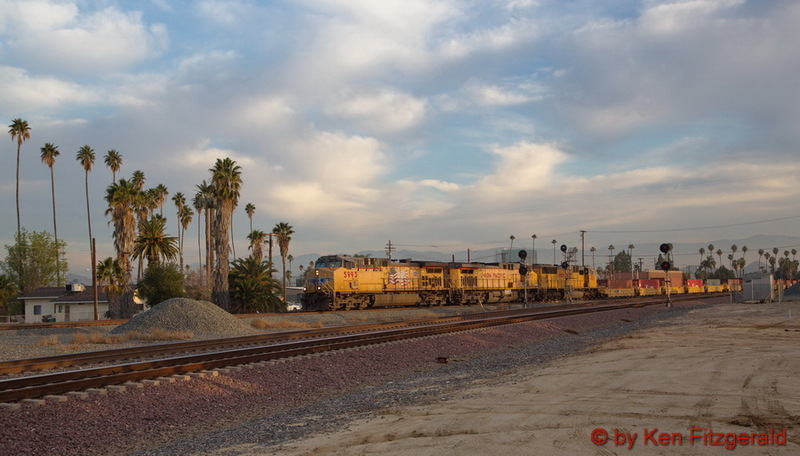 The train on the right is about to leave for Los Angeles while the train on the left is laying over. 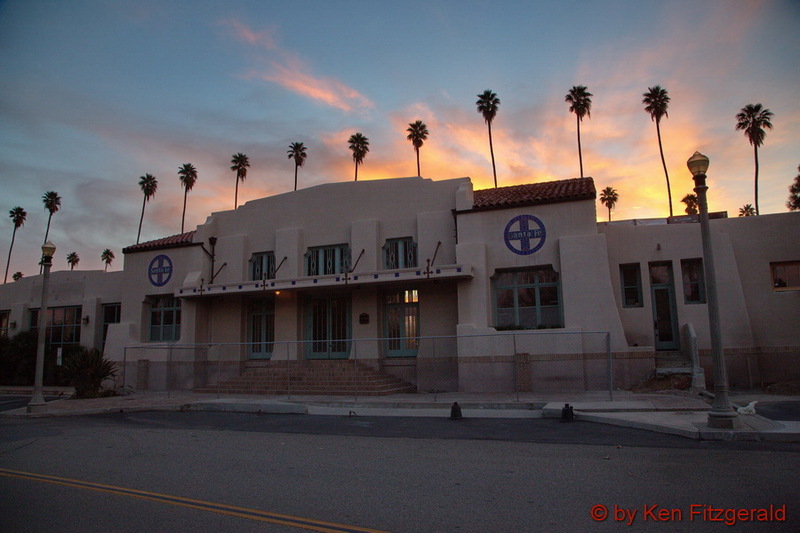 I drove over to the street side of the presently unoccupied Santa Fe passenger depot for these two shots. I started to move in closer for more detailed views, but then saw to the right what I thought was just a pile of tarps start to move and half a dozen or so homeless people began to emerge from their night shrouds. 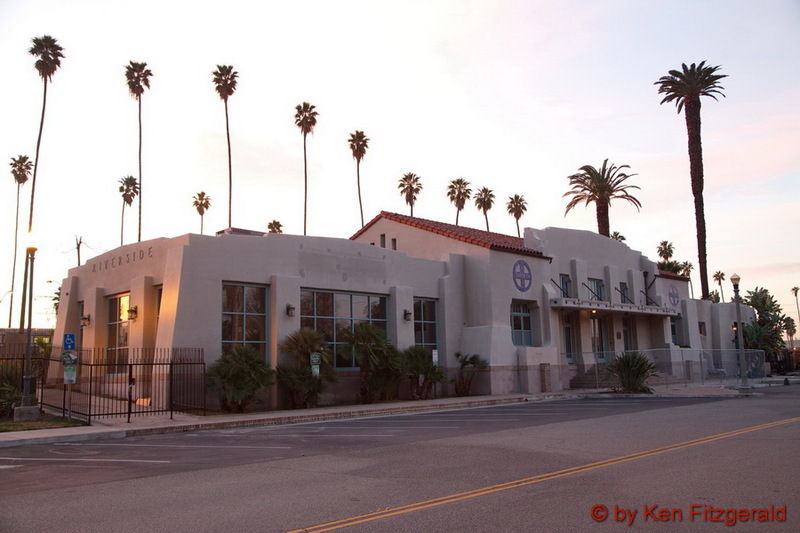 I did not have time to deal with them so I quickly left and drove over to what had been the Union Pacific passenger station. The UP main line used to run down the middle of this street, but now the UP uses the BNSF tracks a block to the left and the building has been re-purposed. With the tree growth this was the only decent shot I could manage. 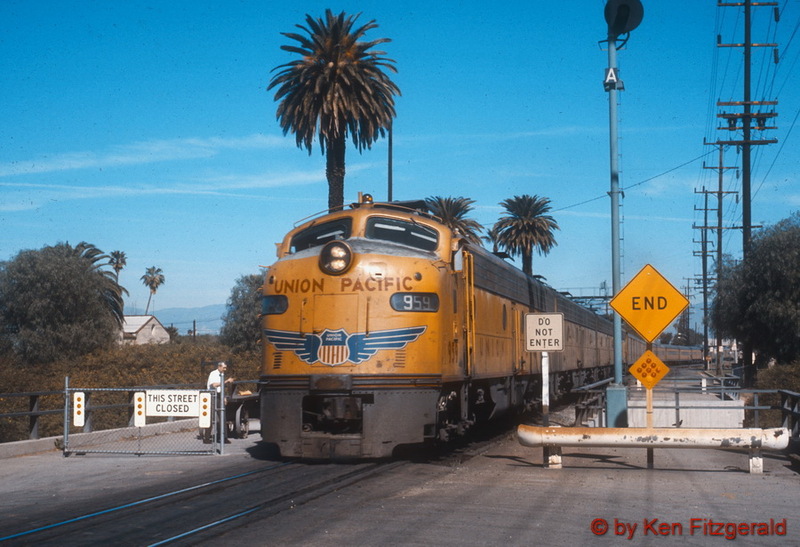 There is not a single marker left today to indicate this was once the UP depot in Riverside, but back in 1971 that was not the case. 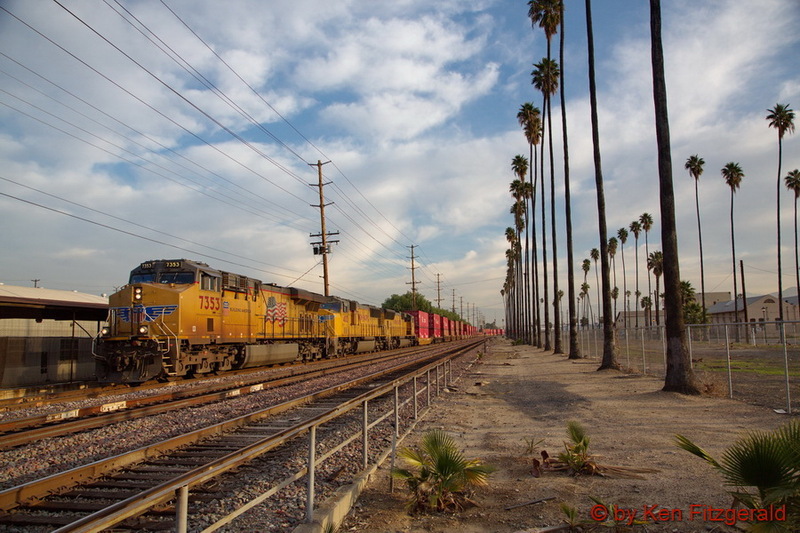 The tracks were definitely busy and this is where a moment later I got my only decent photo of a real “in regular freight service” DD40AX westbound towards Los Angeles. 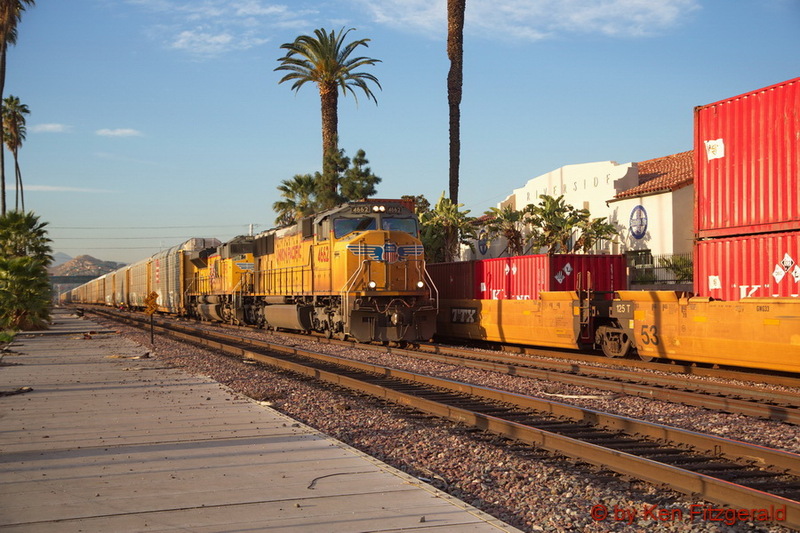 Another DD40AX and a SD24B were trailing. 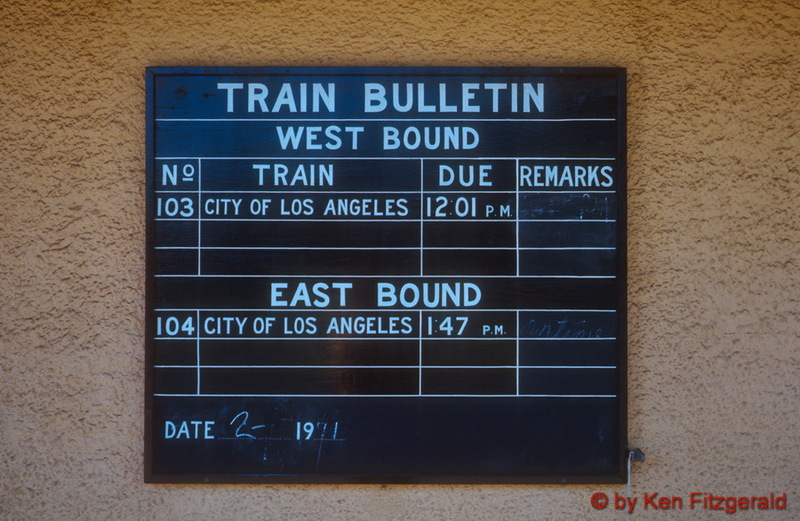 It was now 11:30 am, and the westbound City of Los Angeles was due in 31 minutes. 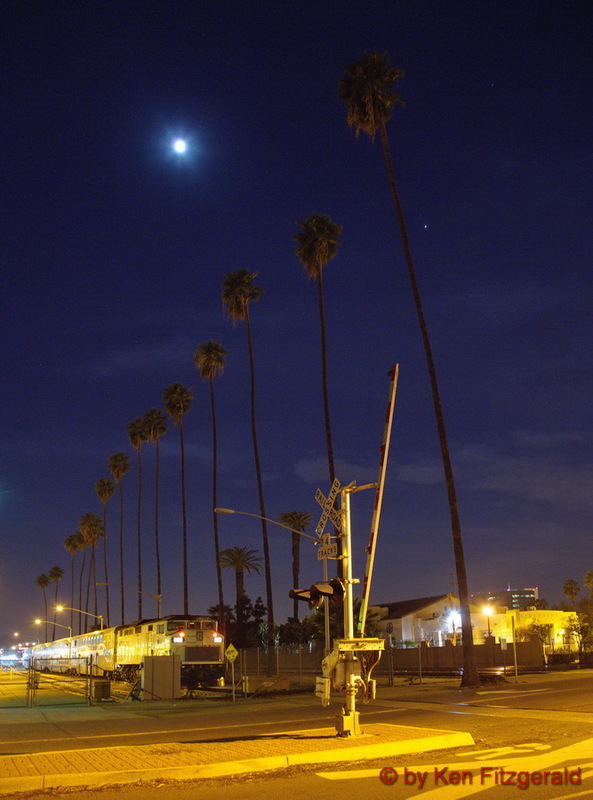 My parents obliged my wish to stay and I took this view of the long train pulling into the station. Here is what this spot looks like today. 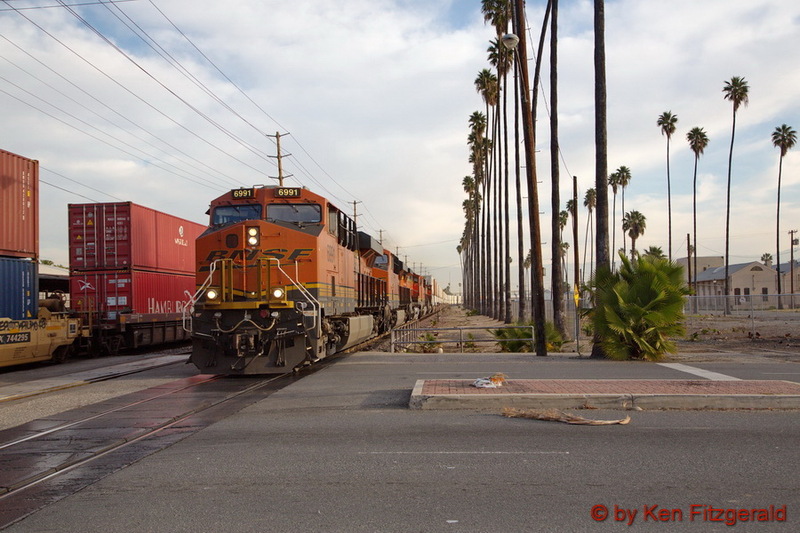 The sun was up enough now for good action photos so I drove over to the east side of the current main lines and set up a few blocks west of the Metrolink depot where the BNSF and UP main lines split. 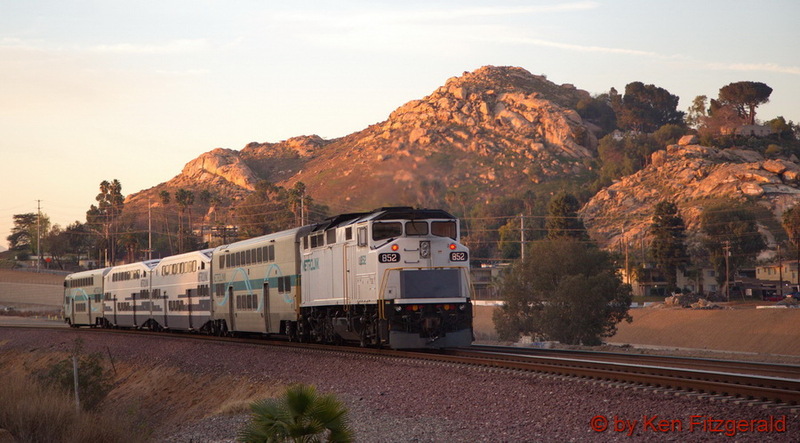 First up was this westbound commuter train heading for Los Angeles. 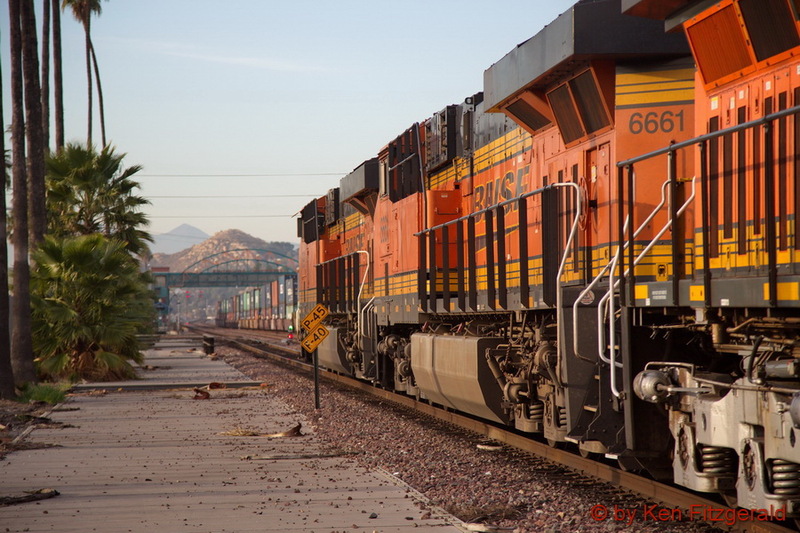 I understand that many of these Metroling commuter rail trains are running with a leased BNSF unit ahead of the cab car while the safety of push-pull operation is debated, but I did not see any on this day. The going away view with Pachappa Hill in the background. 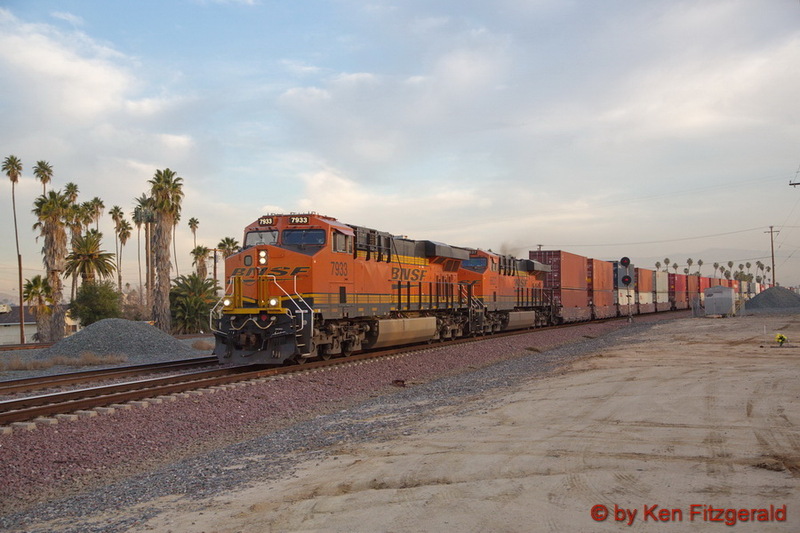 A few minutes behind was this westbound BNSF intermodal with a 2 x 2 power configuration. 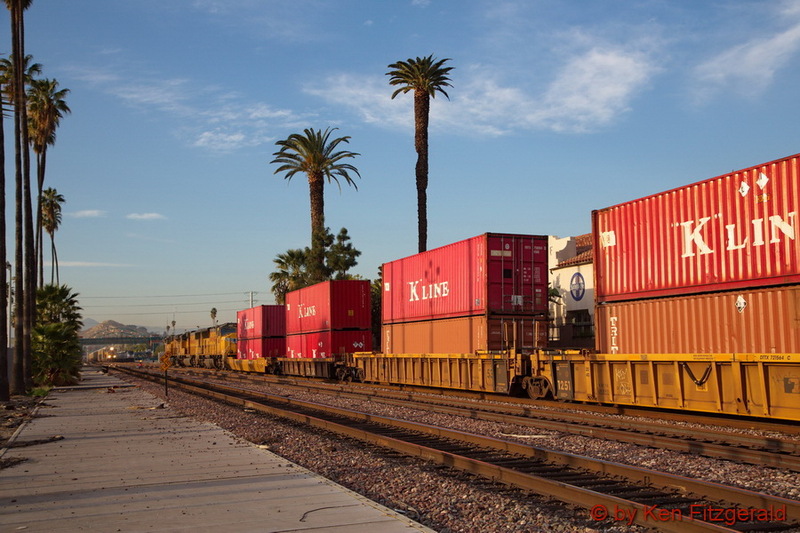 Next up was a westbound UP intermodal moving onto their own tracks for the rest of the journey into Los Angeles. 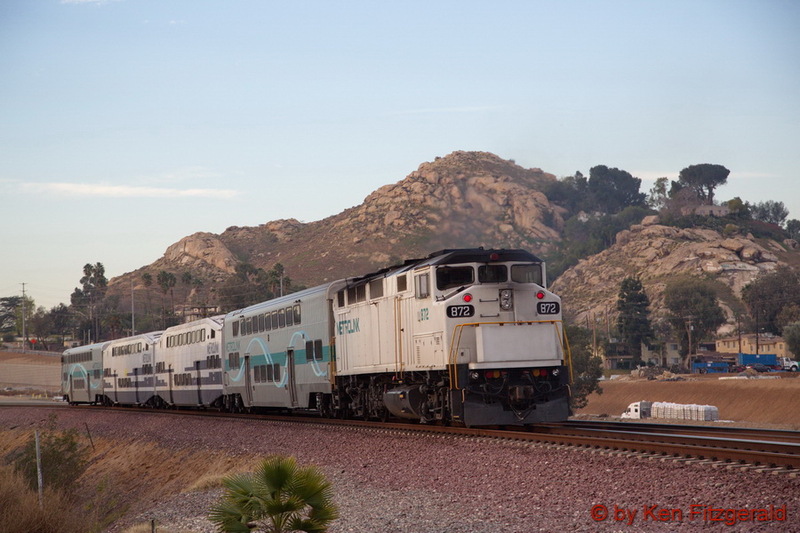 As the intermodal was passing in the background another Metrolink train rolled by on the way to Los Angeles. 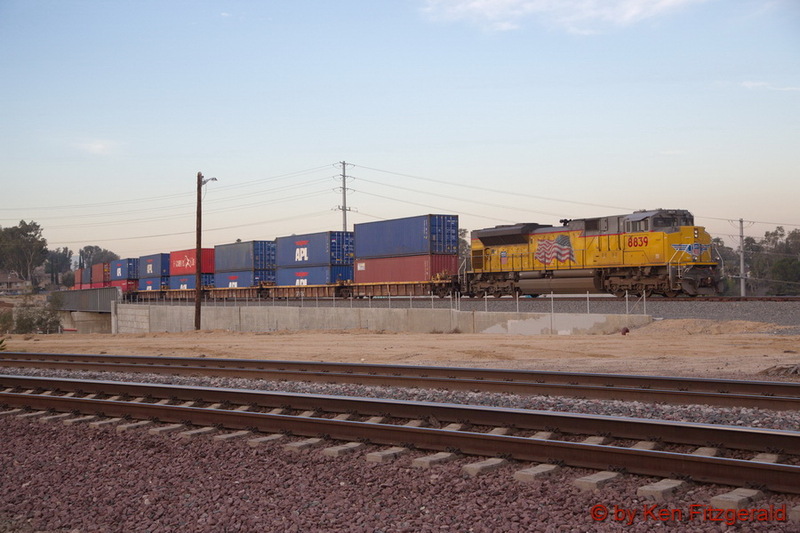 A few minutes later a single DPU pushing on the rear of the UP intermodal came by. 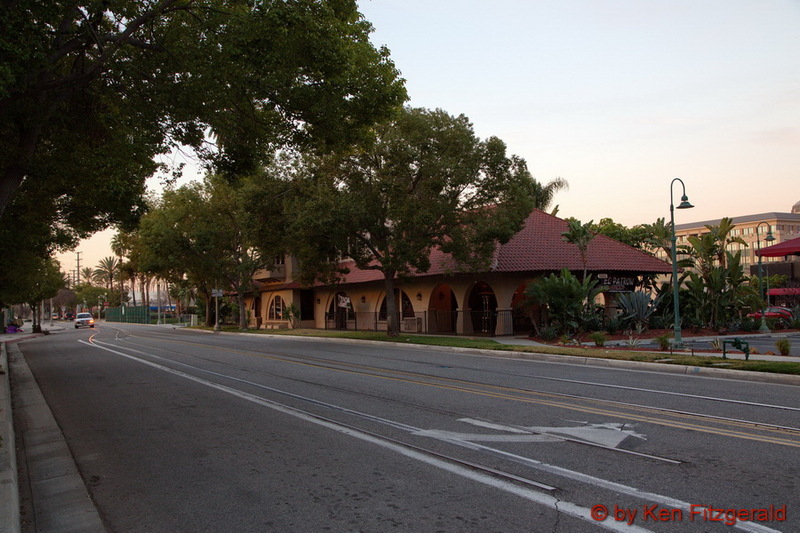 I moved to the Mission Inn Avenue grade crossing just east of the old Santa Fe station. 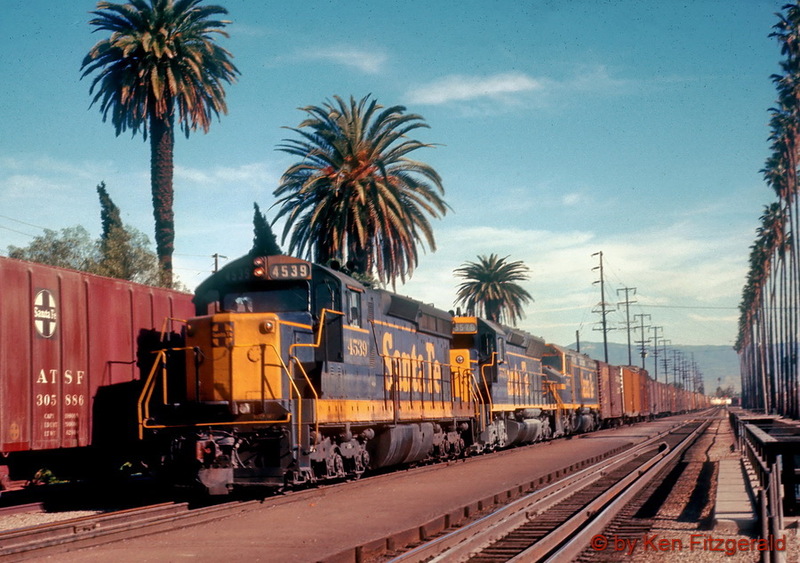 It was here I took this photo back in 1971 of a westbound Santa Fe freight train led by EMD SD24 #4539 in the pinstripe paint scheme with a SD45 and a F45 trailing. 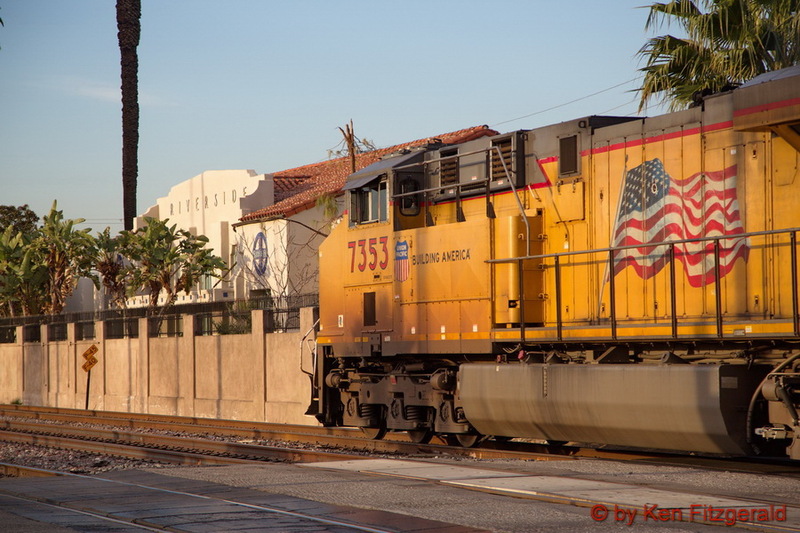 Here is as close as I could get to the original location with a westbound UP train doing the honors 46 years later. 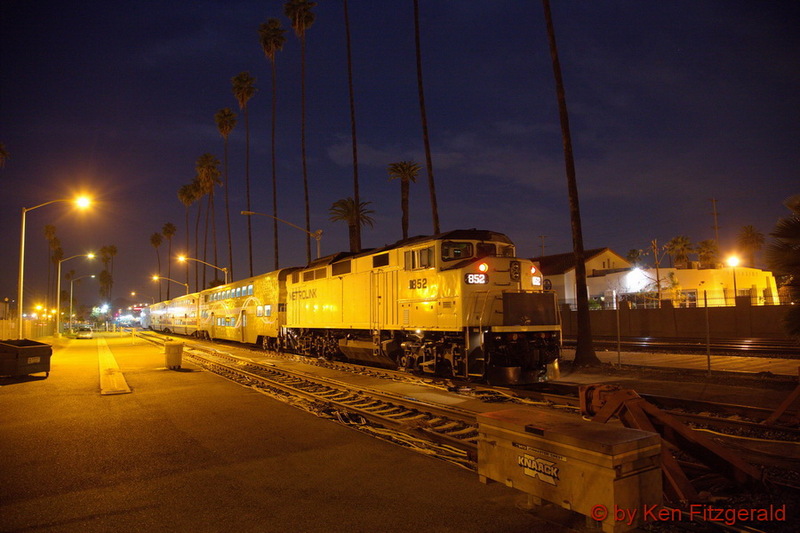 As the westbound passed by the Santa Fe depot, the headlights of an eastbound UP were visible in the distance coming through the Metrolink station. 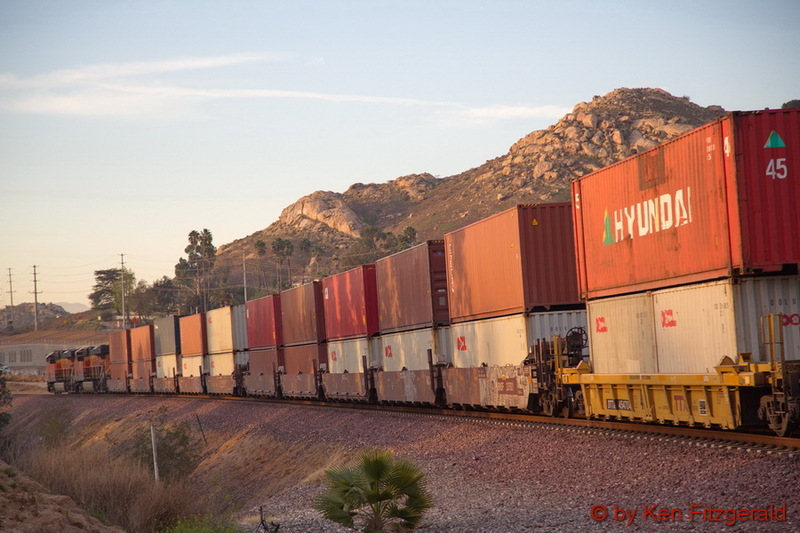 It turned out to be an autorack train. 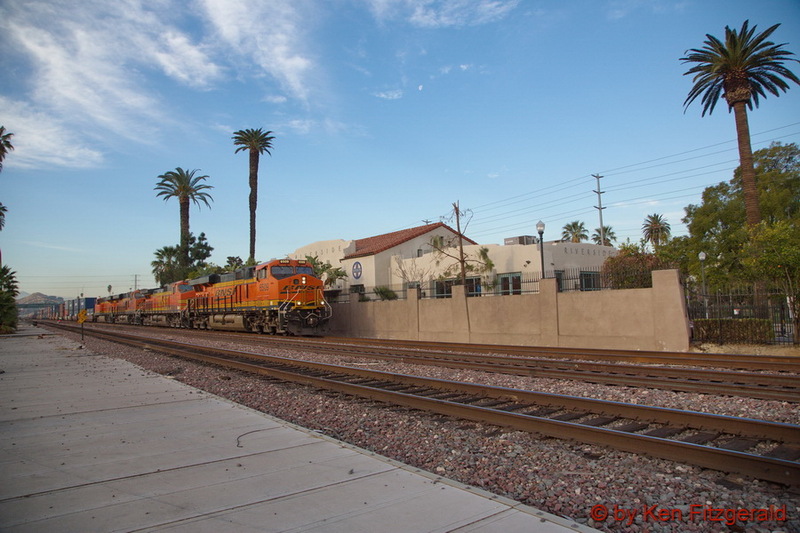 Ten minutes later a meet here was repeated except this time with two BNSF trains doing the honors. It was time to leave for the airport, and I walked the half block to where I had parked the rental pickup. 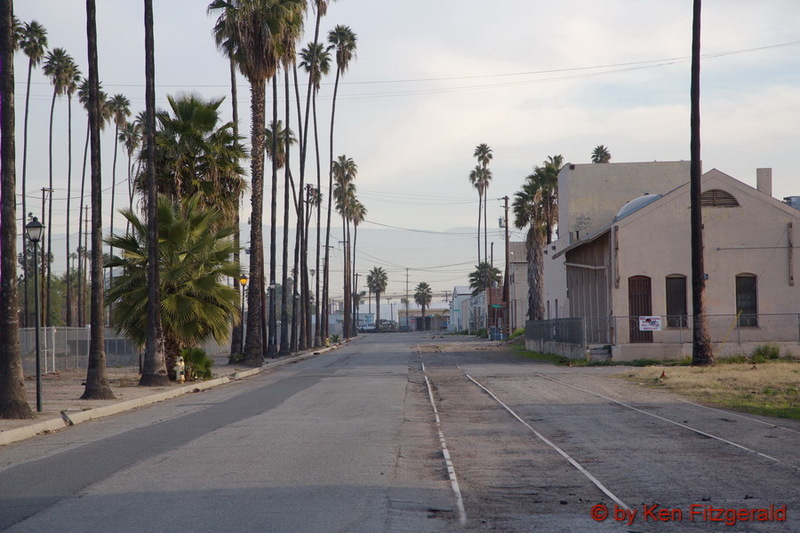 I took this last photo of the morning looking east up Commerce Street paralleling the tracks. 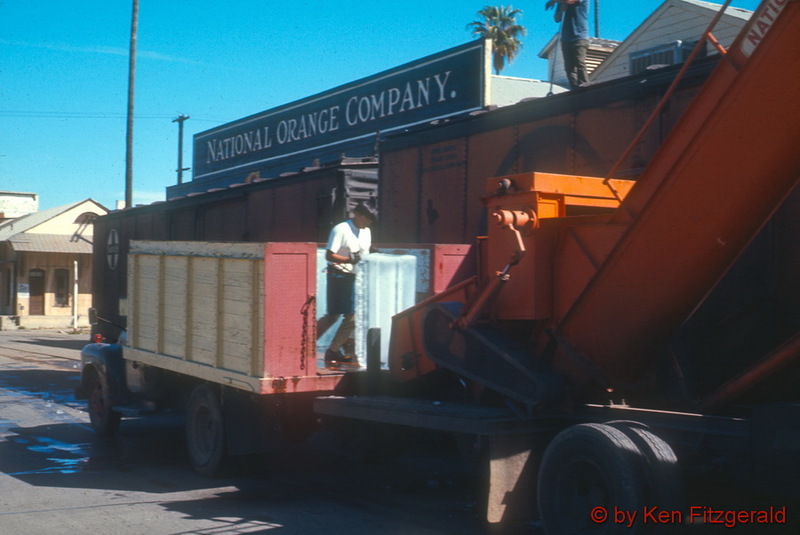 Forty-five years earlier I took my last photos of that day at this same spot of two refrigerator cars at the now closed National Orange Company that were having large ice blocks crushed and conveyed into their bunkers. 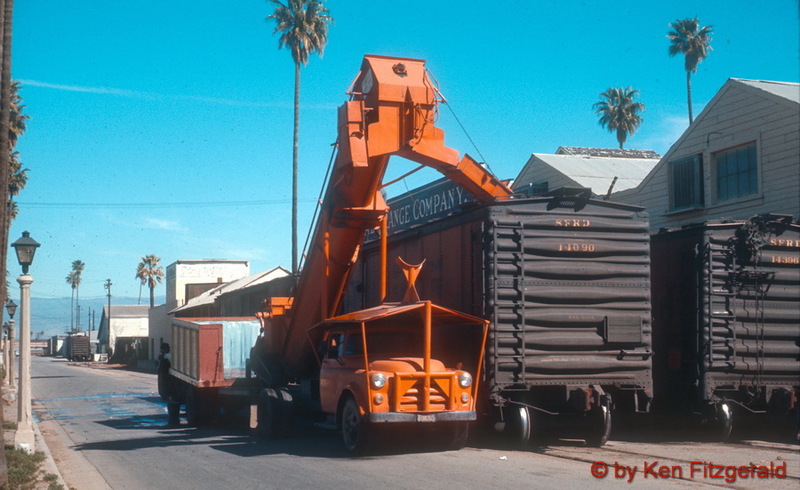 A common sight in 1971 and for many years before, but now a part of history replaced by the modern technology of self-contained diesel-powered refrigeration units. 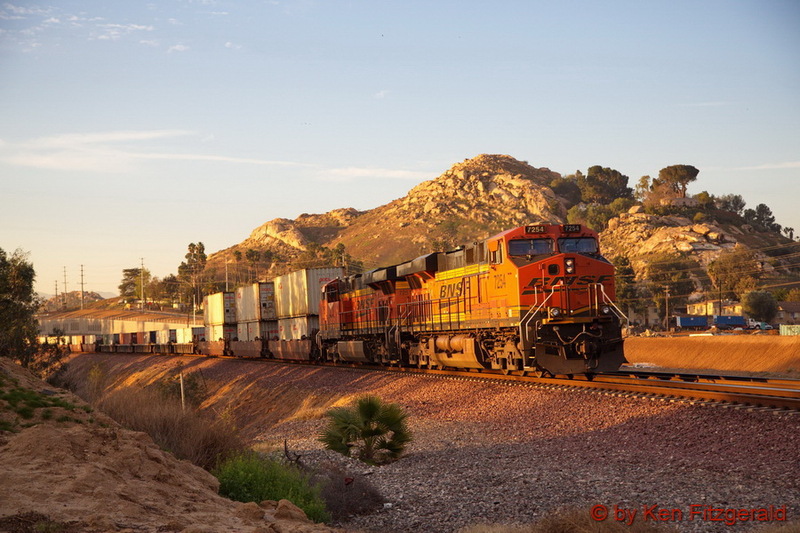 Many thanks to BNSF for providing the opportunity to revisit my past! Ken. Wow! 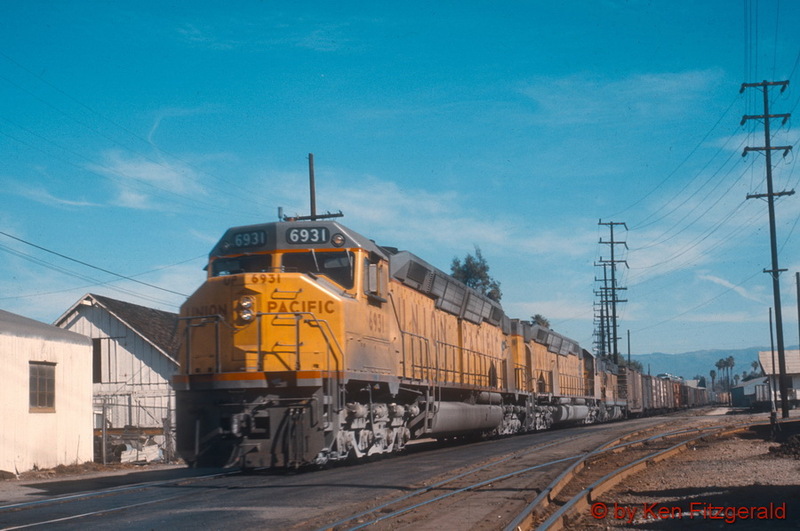 you got to see some classy trains during the good old times. I wish that I had the wisdom you had as a young man to go take pictures. Nice work! LOVE the “now and then” portion of this blog entry. As always, great shots! 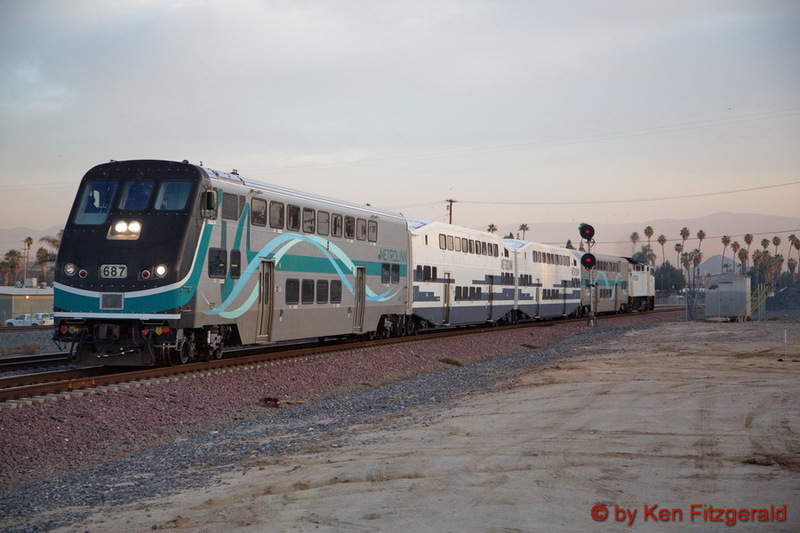 You were fortunate to get images of the Rotem cab cars before Metrolink began running freight locomotives in front of them for crash protection.